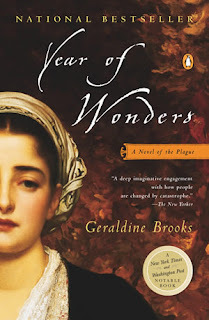 I was scanning my bookshelf looking for the next book to read, when I saw Year of Wonders laying loosely on top of the other books. Jill's sister gave her this book. Judging from the cover, it seemed to me the book was directed at the female audience. But I read the back cover and it intrigued me, so I decided to place it on my list. It took 50 pages for me to get into it. After that, I could not put it down. Although towards the end, I was considering not finishing it. Anna Frith tells the story of how her village succumbs to the Plague and how, under the direction of their young minister, the people decide to isolate themselves to keep the Plague from spreading to other villages. The Gowdie women are healers and try to understand how herbs and roots strengthen and heal people. But many of the villagers believe them to be witches. They die at the hand of a few true believers to the shock of Anna. Later Anna and Elinor Mompellion take up the Gowdie womens' mission and endeavor to bring relief to those who bear the Plague. Their acts of kindness, along with Michael Mompellion's (the minister) unwavering will to keep the village together, help the people endure and survive the Plague. Once the Plague has passed, the village is shocked again by the murder of Elinor, at the hand of Anna's stepmother. From there, the plot unravels into scandalous secrets and affairs. Anna escapes the village fleeing the dark-side of Michael as well as the Bradfords. Like I said, it took me 50 pages of reading before I got into the book. From then on until the Plague passed, I could not put the book down. But from the point of Elinor's death on, I contemplated not finishing it. But of course it would gnaw at me if I did not finish it. The body of the story was really enjoyable. I liked reading about the heroics of Anna and Elinor and the determination of Michael. I was really cheering for them. I could also read into the foreshadowing of Elinor's death. I thought she would die of the Plague, but as soon as I began reading the part where the village gathers to celebrate the passing of the Plague, I knew something more sinister would happen. From the murder of Elinor to the end of the book, I felt like I was reading a lusty, dark novel. The last few chapters just didn't jive with the rest of the book. Michael turned out to be a very dark and corrupt person. Instead of the faithful, pious minister who would be an inspiration, he was the corrupt and evil priest we've seen in movie after movie on our TV and theater screens. I just found it hard to believe. Brooks' descriptions of events were fabulous. But at times they were too gory. I was very squeamish during the two deliveries Anna attended to ... too much blood and fluid. I guess women probably wouldn't squirm at those descriptions, but it was too much for me. Aphra's treatment of her three-year-old's dead body was a little to much too. After reading that, I considered putting the book down for good. Some parts of the book are definitely R-rated. Overall, it was a good book, but I know for sure I won't be reading this book again. If it ever is made into a movie, I think I'll have to pass on watching it.